King of the Hill meets Metal!! Mmm-hmmm. 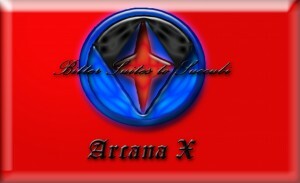 Arcana X 2nd Assignment: Bitter Suites to Succubi!! Chapter 5 Pt.2!! Beatrice, impressed with their strong salute, returns it. Amanda follows suit. Just as they turn to leave, Tiphanee approaches Beatrice and Amanda. “Excuse me, Lady Beatrice,” she says. Beatrice looks back at her. Tiphanee was about to speak when she shies away from her. Beatrice looks at her oddly. She faces the raven haired girl fully. A moment ago, Tiphanee displayed an outgoing demeanor. Now she shows the same timidity as her sister Tamirei. She even begins to fidget like her. So different yet so much alike, Beatrice thought. “Before you were so bold and now you peep quieter than a mouse,” she says with a tease. Feeling like she is embarrassing herself, Tiphanee quickly collects herself and makes a request. “I-I would like to be your subordinate, Milady,” she says. Beatrice is taken by the request. Never before has a recruit asked her to be her subordinate. Most of them would be intimidated by the mere mention of her name or feel they are unworthy of serving under someone of her caliber. Amanda only became her subordinate because Beatrice requested her after seeing how well she kept Willow in line. It was a rocky start at first. Amanda was extraordinarily nervous but she has come around and now sometimes advises Beatrice on several matters as well. Beatrice ponders the girl’s request. Perhaps she could use another subordinate. After all, she is the only high ranking knight with just one underling. With another subordinate serving under her, she can have more assignments completed as well as give Willow another companion besides Amanda. Besides, Tiphanee’s tenacity might rub off on Willow. However, before Beatrice could give an answer, Amanda steps toward Tiphanee. Beatrice and Angus look at Amanda strangely. They have never seen her be so shrewd and direct before. Her tone suggested that she might be jealous that Tiphanee asked to be Beatrice’s subordinate. Amanda has been with Beatrice for a couple years and has gotten intimate with the Ashford sisters. She has taken on Beatrice and Willow as the sisters she never had. With them, she feels like she can be a real girl since there was no time for femininity growing up with brothers. She doesn’t want anyone disrupting her harmony with them, especially this young, loud upstart. Secretly, she hopes her diverse knowledge of the rules and regulations of knighthood deter Tiphanee and make her choose another knight to serve under. This little wench is not coming between me and Lady Beatrice, she thinks. “Aye, that is true,” says Angus. Amanda hides her smile, thinking her plan worked. “However, you overlooked one thing, lass. A captain can bestow the rank of Squire upon a recruit they see fit to serve under them and then assign that Squire to their lieutenant. With the Head Recruiter’s approval, of course,” he added. Angus pauses a moment to allow Amanda to process the shock. She had completely forgotten about that rule since no recruit before Tiphanee today requested to be Lady Beatrice’s subordinate. And to make matters worse, Angus is the Head Recruiter. He knows the rules and regulations as well as she. He has final say in which recruits move on to become Squires. A wide grin parts the flames of his beard. “So Lady Beatrice, would you like Miss Tiphanee Ann Knoxville as your subordinate?” he asks. “That depends, Sir Angus Macrory, do you approve of this recruit serving under me and upholding her position as an Arcana Knight in training?” Beatrice answered with a mocking tone. “Well then, Tiphanee Ann Knoxville, I, Beatrice Marie Ashcroft, High Captain of the Knights of Arcana Kingdom, hereby bestow upon you the rank of Squire. You will be assigned to serve under First Rank Lieutenant Amanda Blayke,” she said with formality. “What?! But Milady—” Amanda started to protest before Beatrice cuts her off. Amanda thought about voicing her opinion again but opted against it for fear of punishment from her superior. With a heavy sigh, she agrees to Beatrice’s order. “Yes, Milady,” she said, stifling her reluctance. “You’re going to Eshtar, Milady?” asked Tiphanee. “Yes, of a diplomatic matter,” Beatrice replied with a sigh. Tiphanee laughs. “Lemme guess, the Steamists and the Alchemists are at it again,” she says, looking Beatrice and Amanda over. “How do you know that exactly?” Amanda asked. Amanda gasps at the girl’s remark. The Alchemists and Steamists of the Regal Districts may be chauvinistic but they are still to be respected. “How can you speak that way?! The members of the Regal District are to be respected despite their behavior!” she said in a reprimanding tone. Just then, Beatrice laughs out loud which surprises Amanda. “I have to agree,” says Beatrice. Amanda nods confidently. I knew Lady Beatrice would agree with me, she thinks. Beatrice responds with a nod. Amanda and Tiphanee follow her towards the awaiting carriage ready to take them to Eshtar. Angus, Barlot and Gus see them off before Angus takes the boys back to the grounds to begin their training. Along the way, Gus asks about Beatrice making Tiphanee a Squire before she went through her training. “Aye, that’s true, lad. Normally, recruits would go through knight training before being assigned to be a Squire. However, there have been cases in which recruits were assigned to a ranking knight before they begin their training. At that point, the ranking knight will oversee the training of that recruit,” Angus tells Gus and Barlot. “So Tiphanee is going to be trained by a High Captain so she can severely kick our asses,” Barlot mused, recalling his earlier defeat by Tiphanee. Tiphanee is well diverse in combat to begin with. He wonders just how much better she will become under Lady Beatrice’s tutelage. Barlot will not admit it out loud. The thought worries him. He resorts to his usual banter to cope with the terrible thought. “Wonderful,” he finally says. Angus drapes a burly arm across the dark haired young man’s shoulders to comfort him. “Don’t worry yourself lad. Eventually, you’ll forget about Miss Knoxville beating ya,” he says. “Yeah, how do you figure that?” asked Barlot. “That’s easy, Sir Matheson. The next time she gives ya a whoopin’, it’ll be so bad you’ll forget about the first one,” Angus answered. Then he bursts out with laughter from deep in his belly. Barlot drops his head and sighs. “Thanks, I appreciate the info,” he says cynically. Angus then escorts Barlot and Gus back to the training grounds. (Check out my first novel Defenders!! CLICK HERE!! Get your copy of Defenders Volumes 1 and 2 through the links in the J1 Studios Bookstore for your Kindle and eBook device! !